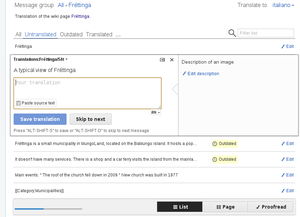 This page is a translated version of the page Extension:Translate and the translation is 7% complete. That's ok if they are on different continents. ũguo nĩ wega tondũ wĩĩra nĩũrarutĩka mathaa mĩrongo ĩĩrĩ na mana o mũthenya. kĩrĩa mabataire nĩ gĩkundi gĩa kwaranagiria. They would all be able to read English if they are translating right? 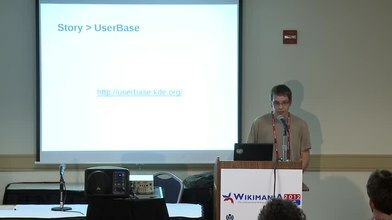 Teach a few simple wiki markup such as links and what to do with categories. magacoka magateithia angĩ nao magateithia acio angĩ. We have over 40 in a chat who help each other and have fun at the same time. And they were all scared of the wiki but couldn't believe how easy it was once they started. They are actually waiting on me for more translations to do because I can't keep up with them. I know there is only 1 translating this language or that language. ona ĩyo twĩ nayo. ũmwe areka Swahili, ũngĩ naake Japanese. Also, you mark pages for translation. You control whether to include templates or exclude variables in template calls.